With preparations for the Feb. 12 launch of shuttle Discovery on a space station assembly mission in high gear, NASA managers met today and agreed to press ahead with plans to launch the shuttle Atlantis as early as May 12 on a final mission to service and upgrade the Hubble Space Telescope. But Bill Gerstenmaier, director of space operations at NASA headquarters, deferred a decision on whether to require use of launch pad 39B for a potential emergency rescue mission. A final decision will be made in mid March, after safety analysts fully assess the pros and cons of the single-pad vs dual-pad rescue scenarios and after engineers with NASA's Constellation program report back on the feasibility of making a critical test flight from 39B in July as currently planned. NASA plans to retire the space shuttle fleet in 2010, after nine more flights and completion of the international space station. The agency plans to replace the shuttle with a towering new rocket known as Ares 1, made up of a five-segment shuttle-derived solid-fuel booster and new upper stage powered by an advanced Apollo-heritage hydrogen-fueled engine. The Ares 1 will boost new Orion crew capsules to the international space station. To gather engineering data to help validate computer modeling, NASA plans to launch a test rocket, known as Ares 1-X, from pad 39B in July. The test rocket will feature a standard four-segment shuttle booster, a dummy upper stage and an Orion mockup. As of this writing, the Ares 1-X is about a month behind schedule and observers are not optimistic that time can be made up. If not, the flight likely will slip into the Fall timeframe because of conflicts with other shuttle flights. But during today's meeting, NASA managers decided to preserve the option of a July launch until the processing schedule is more definitive. Originally scheduled for launch last October, Hubble Servicing Mission 4 was delayed when a data processing system aboard the space telescope malfunctioned in late September. Hubble program managers reported today that replacement hardware is undergoing tests and should be ready in time to support a May 12 launch. The space telescope operates in a different orbit than the space station and the Hubble crew cannot seek "safe haven" aboard the lab in the event of a Columbia-class problem. Former NASA Administrator Mike Griffin decided early on that a rescue shuttle would be processed on pad 39B and primed for launch within a few days of an emergency being declared. If NASA sticks with the dual-pad scenario for Hubble, the rescue shuttle - Endeavour - would be processed on pad 39B and, if there are no major problems with Atlantis, moved to pad 39A for launch around June 13 on another space station assembly mission. Using both pads for the Hubble mission would preclude launching Ares 1-X in July. But if the Ares program can make up lost time, the agency could opt to use a single pad, 39A, for the Hubble mission. Under that scenario, engineers would have to move the rescue shuttle - Endeavour - to pad 39A first to carry out initial processing, then roll it back to the Vehicle Assembly Building. 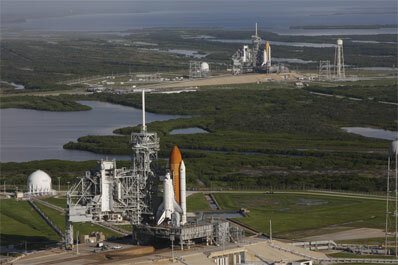 Atlantis then would be hauled to 39A for its launch campaign. 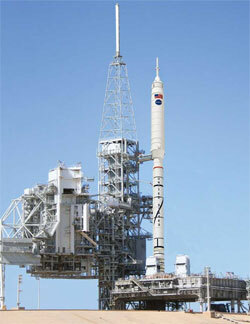 In the event of an emergency in orbit, Endeavour then would be moved back out to pad 39A for launch as soon as possible. Because of the required trips to and from a single launch pad, processing Atlantis and Endeavour using only pad 39A would delay the servicing mission to around May 29 and push the subsequent station assembly mission to around July 13. Debating the various options today, Gerstenmaier decided to wait until mid March to make a final decision. If the Ares 1-X project can make up enough time to have a realistic shot at a mid July launch, NASA might go with single-pad operations for the Hubble mission. By moving Atlantis to the pad ahead of schedule in March, engineers could free up high bay 3 in the Vehicle Assembly Building for Ares 1-X assembly. But that assumes a detailed safety assessment shows a rescue mission could, in fact, be launched from the same pad with a reasonable chance of success. Unlike station-bound shuttle crews that can spend weeks aboard the lab complex awaiting rescue, the Hubble astronauts would need to be back on the ground in about a month at the outside.